Several months and a whole season have come and gone since I posted anything on this blog. It’s been a sad time for me and all of my family as my beloved Dad reached the end of a very long life last September. He was the one that noticed and encouraged my early interests in the nature around us and taught me the names of common wildflowers, butterflies and most particularly birds. He didn’t claim to know everything, but more importantly he gave me the gift of noticing what was there and the encouragement to find information I wanted for myself. He never really got the concept of blogs, or indeed anything to do with computers, but was always interested to hear what I had seen and where I’d been, particularly about the places here in North Wales that he took my sisters and me to spend time in when we were young. Some of those places have remained very special to me and I’m sure that when I visit them, that’s where I’ll always find him. Thank you all for your patience and sticking with me and thank you to new readers that have signed up who must be wondering where I’d disappeared to. While Dad was ill I was spending a lot of time down in my old haunts in Northamptonshire, where my sisters still live, and it was reassuringly familiar and not too greatly changed in the decades I’ve been away. 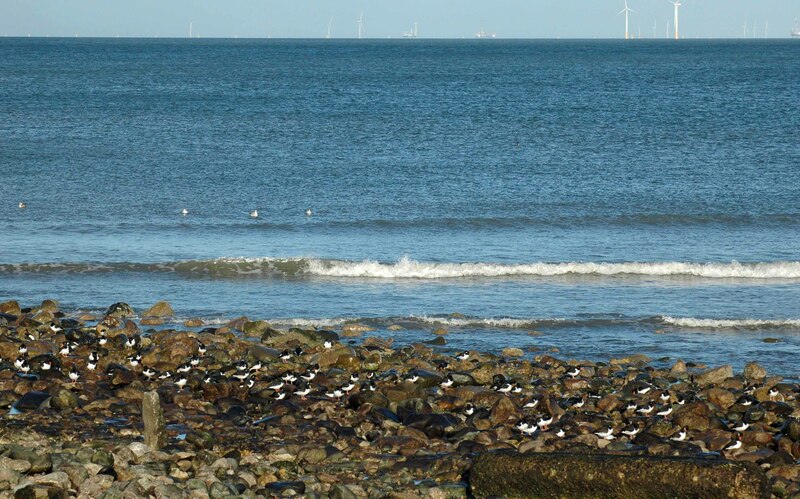 I may do a post or two about our walks there if I am unable to come up with anything more current, but for the time being the so-far mild winter is giving me plenty of opportunity to get out and ideas for posts, starting with this one about the wading birds that are about now on our local rocky seashore. A brilliantly sunny day winkled me out of my cosy shell this morning and I set off, camera to hand to see what I could see from the promenade. I realised I had lost track of the ebb and flow of the tides and had no idea of its current state, so was initially quite disappointed to see that it was fully in and very high. 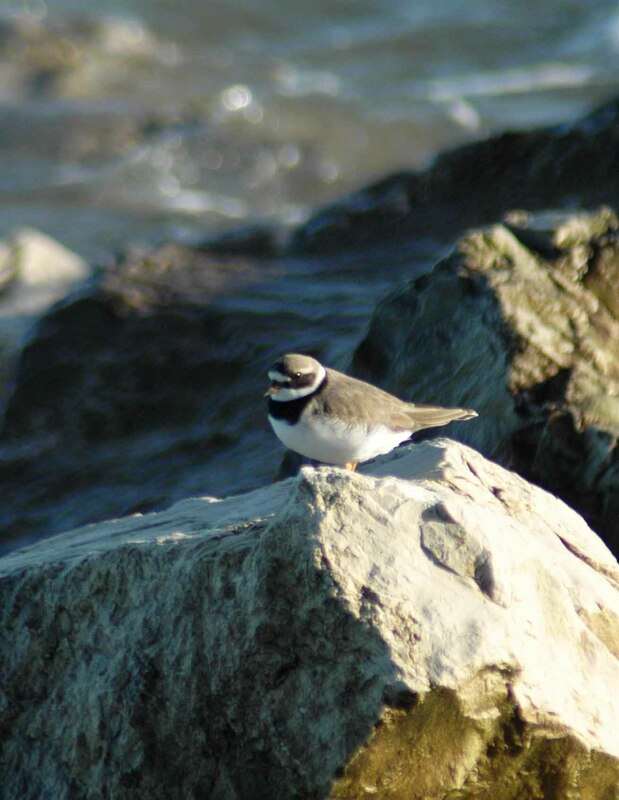 That meant there would be no waders to be seen picking their ways through the rocks that strew the shoreline of Rhos Point pecking and probing the muddy sand in search of food. But I’d made the effort to get myself out and I wasn’t about to go home with nothing, so I thought I’d at least walk for a way for some much-needed exercise and if nothing else there may be a Rock Pipit or two on the rocks or the sea wall. The sea was as blue as the sky and ruffled by what I was feeling as a bitingly cold breeze. I hadn’t walked far when I noticed a largish bird swimming around on the water, meandering randomly and frequently diving and disappearing under the surface for minutes at a time. 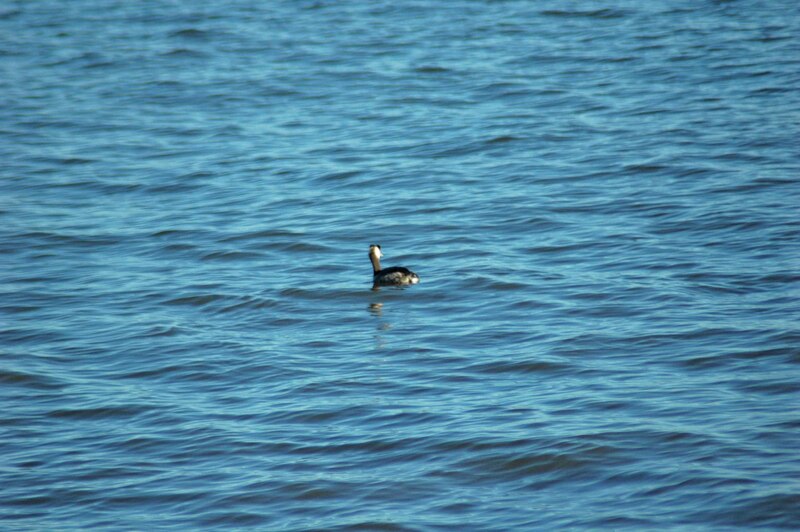 Needless to say, I hadn’t picked up my binoculars and couldn’t properly see what I was looking at, even with the assistance of the camera lens, but from its general ‘giz’, and the fact I’ve seen them here in previous years, I decided it was most likely a Great Crested Grebe. 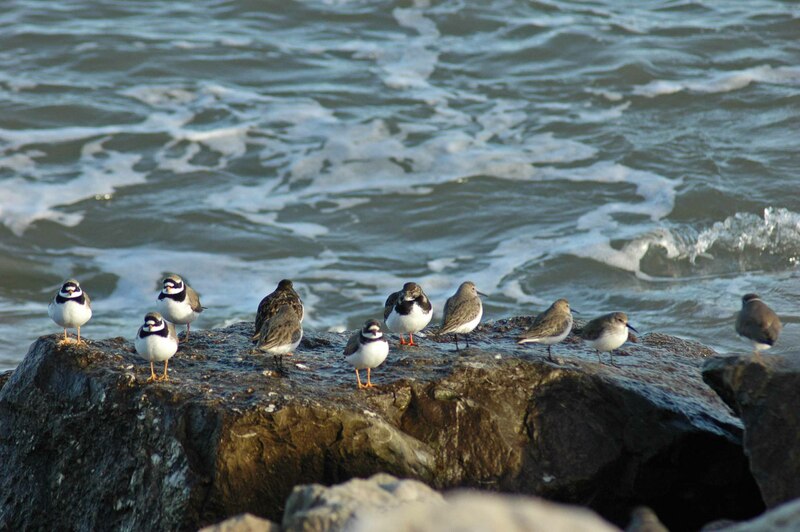 It wasn’t alone either, although individuals were spread quite widely apart, at one time I counted ten of them. I could not get a decent image of any one of them though, so this one is a token effort to verify the sighting! I walked quite a distance towards Penrhyn Bay, stopping now and then to try to get a better image of a Grebe. I spotted one a little further in and got a slightly better view from the top of a set of steps that lead down to the beach. 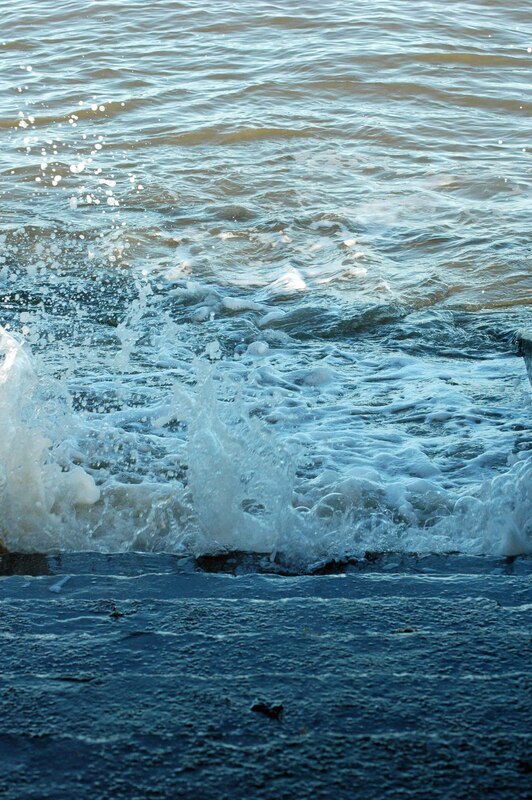 You get an idea of how far the water reaches regularly as the bottom treads are worn smooth by the repetitive scouring of salty waves climbing them and retreating with some force. I wasn’t enjoying walking into the cold wind so I turned around and walked back, but carrying on towards the village. 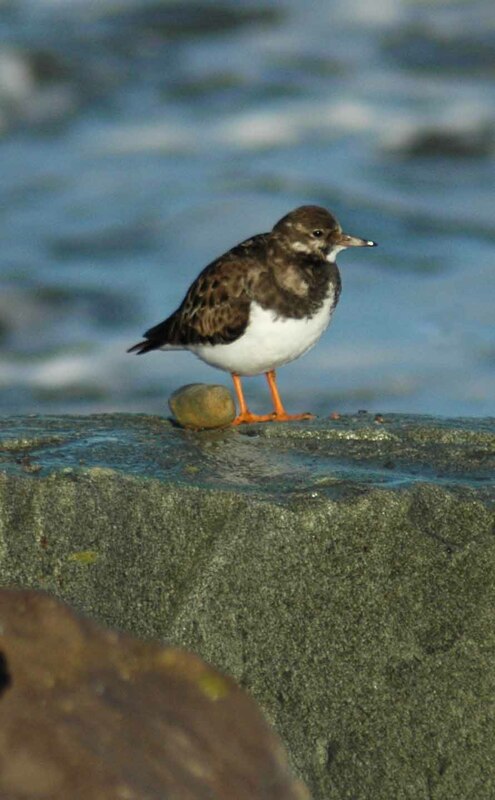 Just past the tiny St. Trillo’s Chapel I caught a glimpse of a bird flying down on to the big rocks below the promenade; a Turnstone. It landed out of eyesight, hidden amongst the huge boulders, but as I searched for it, up it popped onto a rock very close by. 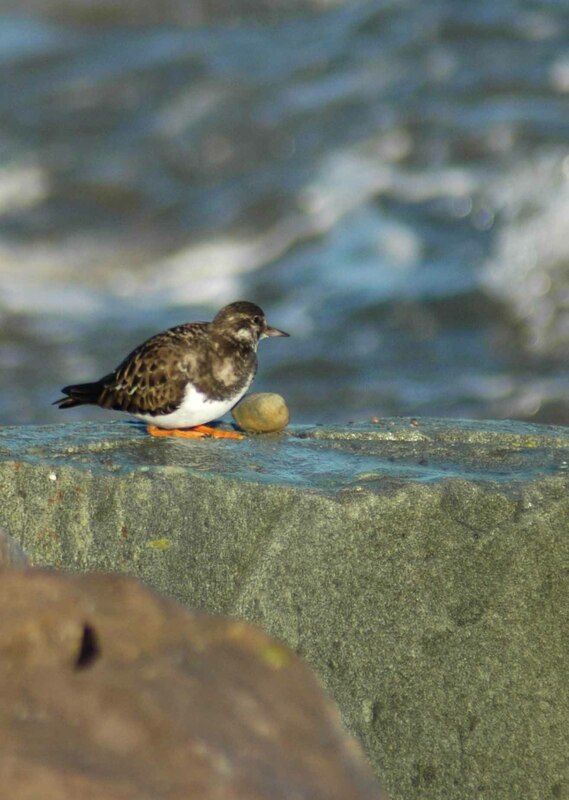 Turnstones are common winter visitors to all our British coasts and gather in the greatest numbers on rocky and stony beaches, as here in Rhos-on-Sea. 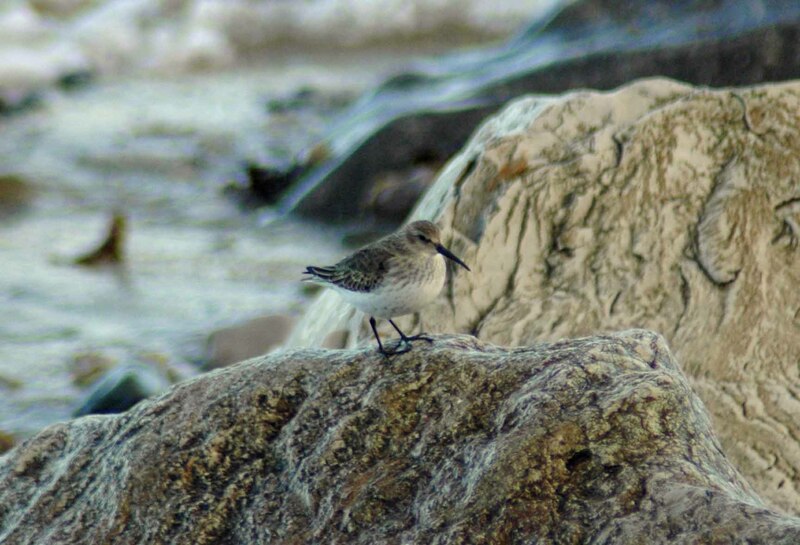 I was very happy to see it, as they are perhaps my favourite small wading bird, and because they are rarely alone I was confident there would be more to see. 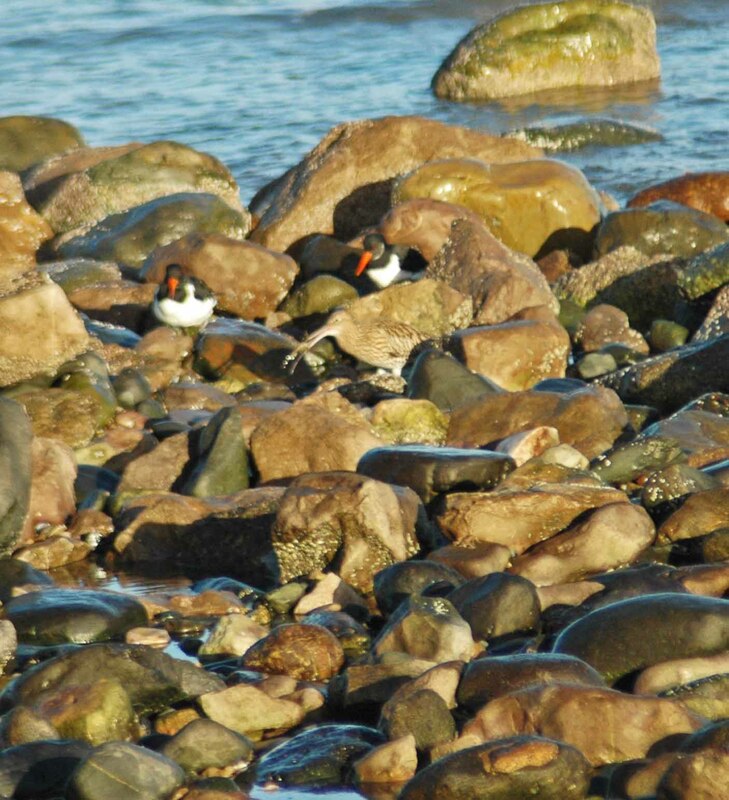 In previous years I have seen small groups of mixed species of waders on the rocks here, so I was hopeful there would be more to see. I didn’t have to go far before spotting another little group waiting for the tide to turn and leave their lunch, this time Ringed Plover and Dunlin. 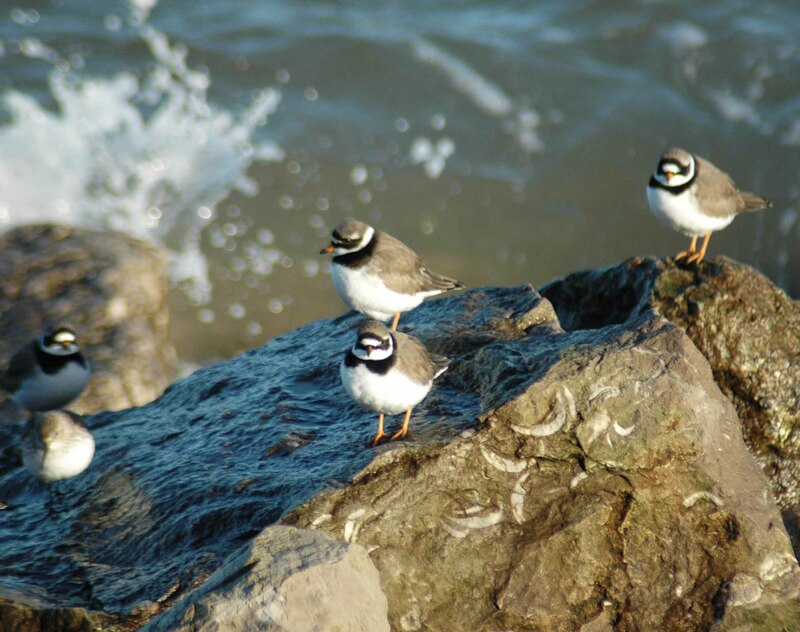 Ringed Plovers are amongst the most common of our shore birds, although the increase in building in seaside localities and our intrusion onto beaches that were once remote, where they traditionally used to breed, have taken their toll on populations. 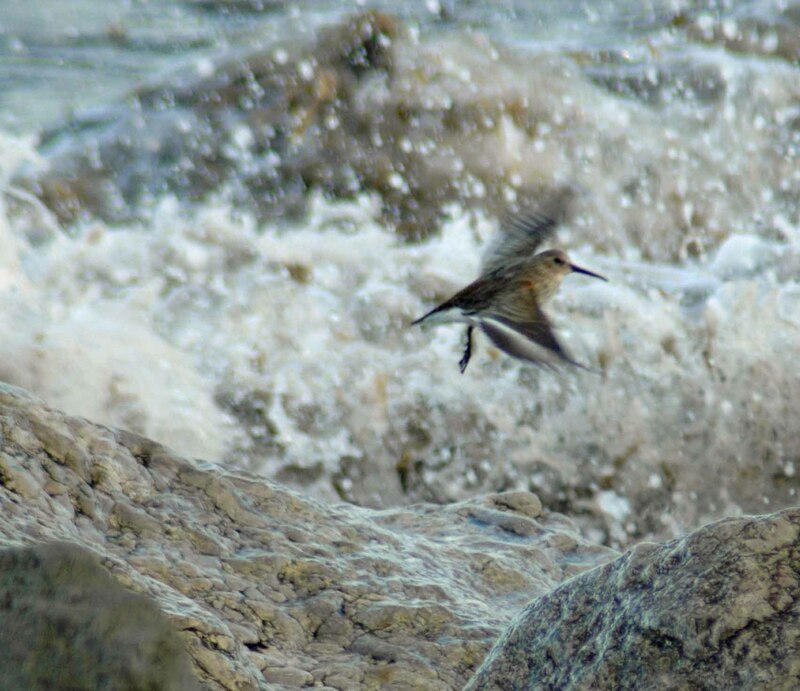 Dunlin are amongst the smallest of our shore birds. Some are present in Britain all year round, and as with Curlews, they winter on coasts and breed mainly on upland moors. Numbers are swelled when sizeable flocks come for the winter. 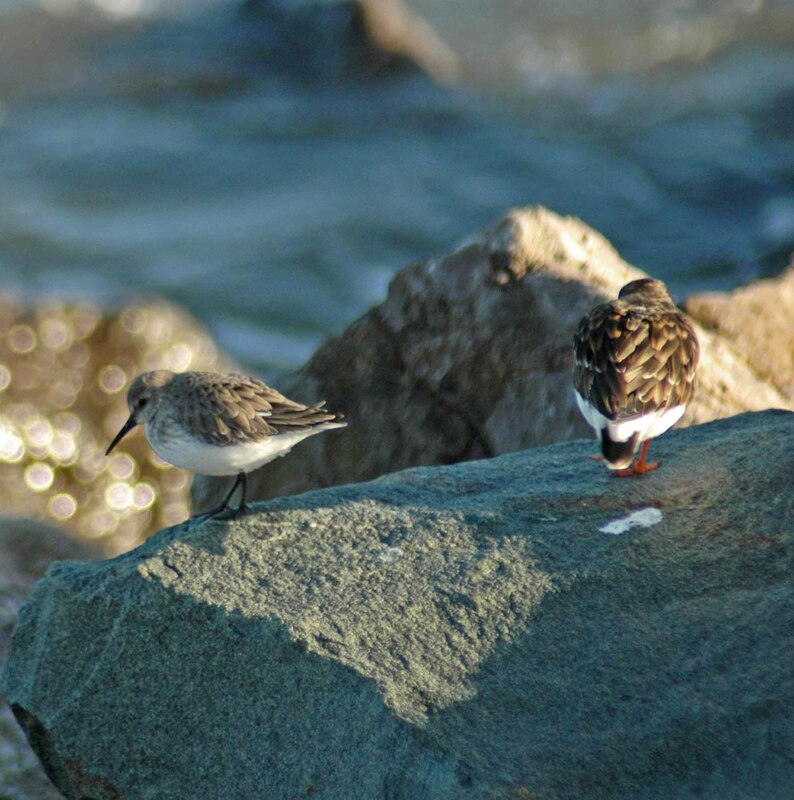 Dunlin were known to wildfowlers of old by a diverse variety of names, including ox-bird, ploverspage, sea snipe and stint. 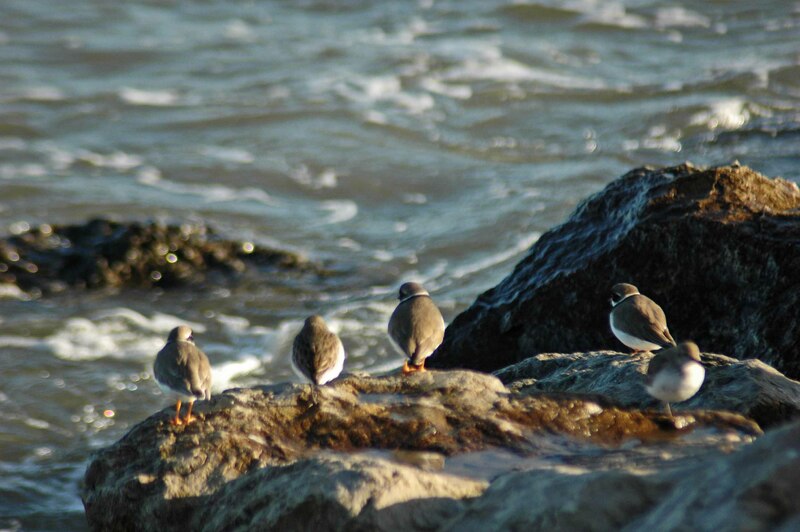 As I watched them I had to wonder how these birds know when the tide is about to turn? It’s definitely not just a lucky guess! When I first began to watch them they were all quite still and quiet, but then in a heartbeat something changed and they became suddenly more animated. Up till that moment they had ignored the close proximity of people walking and me pointing a camera at them, but now people passing by with a dog or cyclists triggered off the Dunlin and Plovers and theytook off as one in a tight little flock out over the sea towards the harbour breakwater, then looped back, showering down to land a few feet further along the rocks. 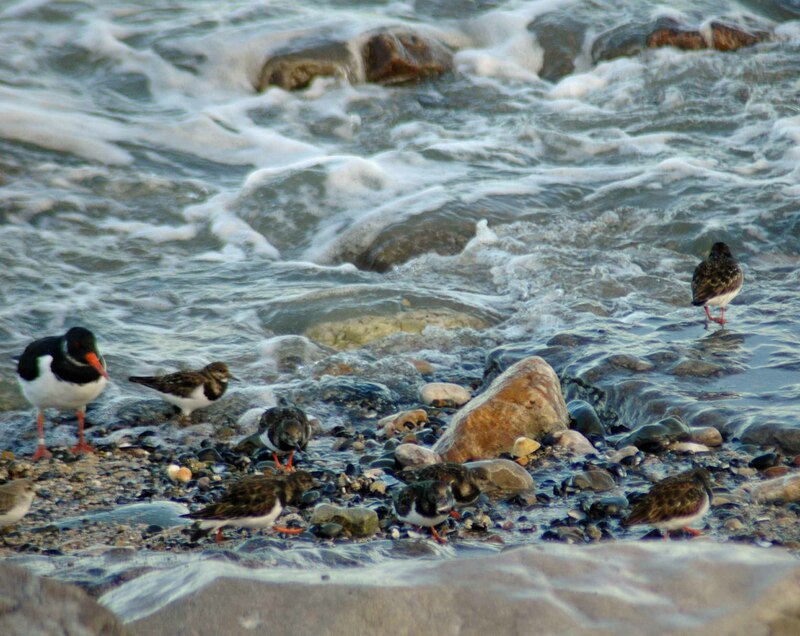 The Turnstones woke up too and were the first to venture nearer to the water, ready to get down onto the first uncovered patches of sand. 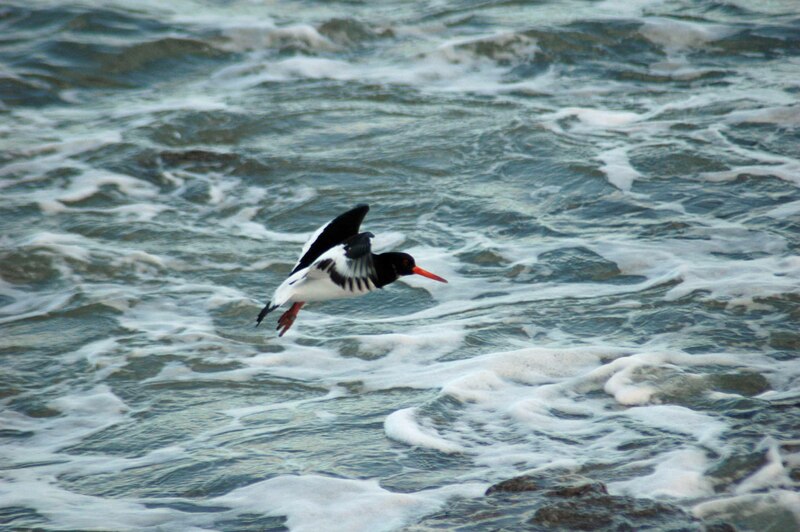 As the tide’s turning became more imminent, Oystercatchers began to arrive. 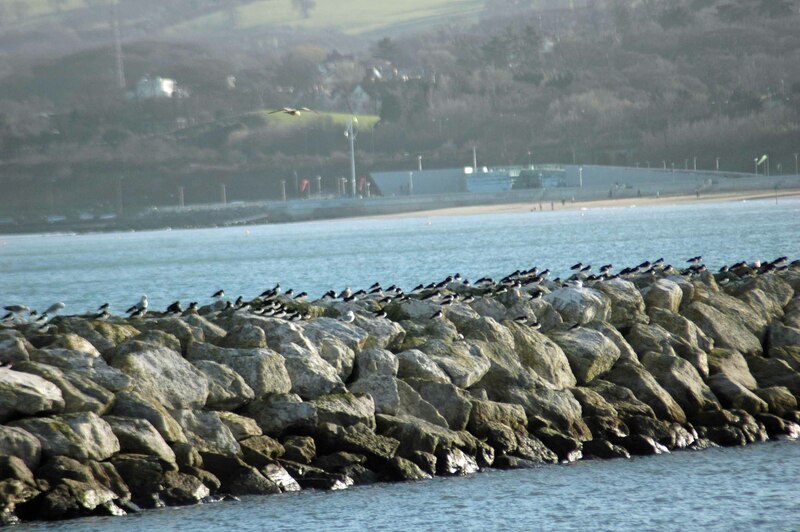 They too had been waiting, but a bit further away on top of the harbour breakwater alongside the herring gulls. 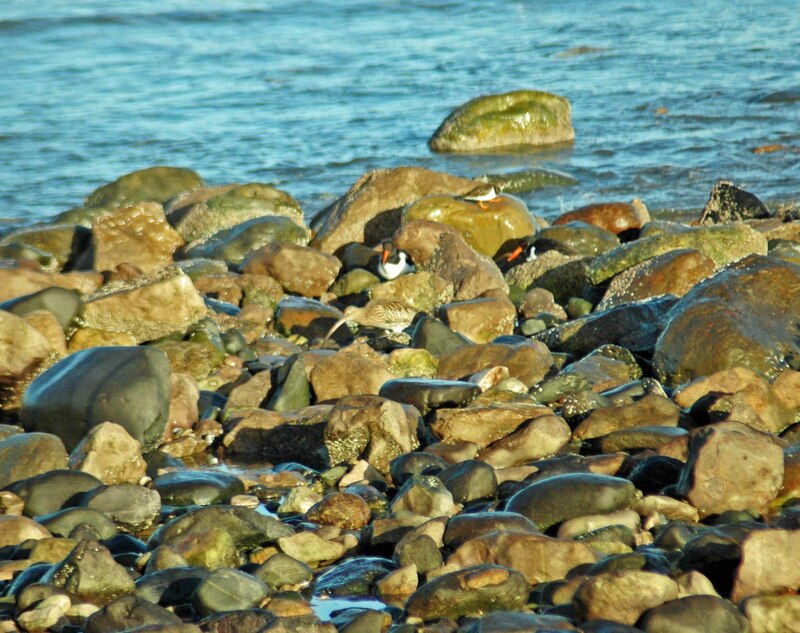 Most of the Oystercatchers headed straight out to the far end of the Point, but a few chose to join the Turnstones, Dunlins and Plovers. 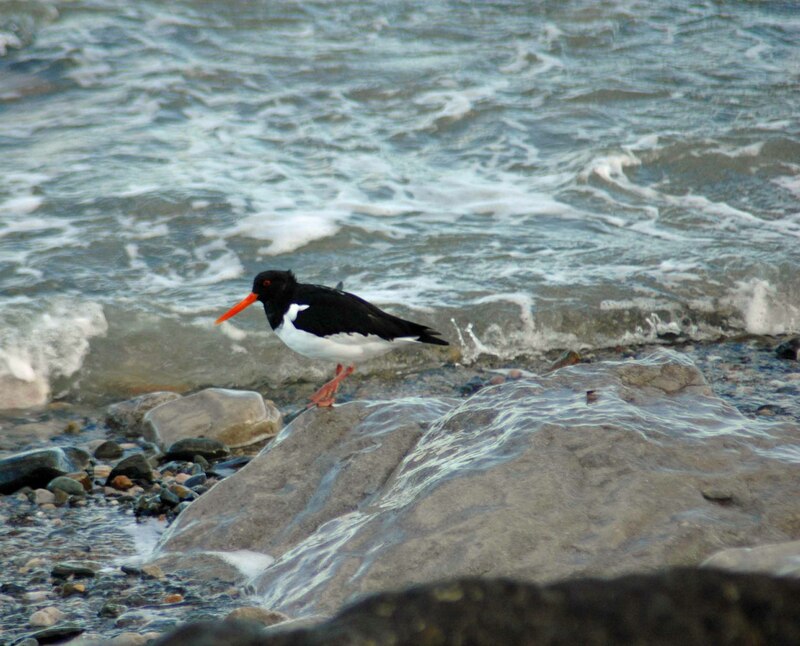 Oystercatchers are the most numerous and conspicuous of the waders here and are a familiar sight on the mussel beds, on the rocky shorelines and in small groups flying low across the sea. They are noisy and gregarious and wonderful, but usually some distance away, so it was lovely to get this opportunity to see them more closely for a while. 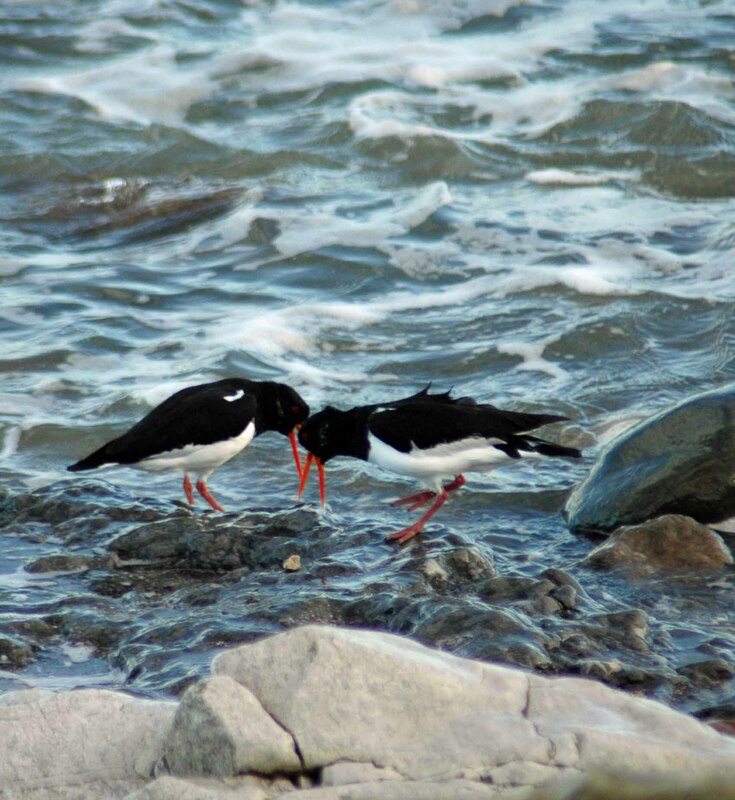 The shrill calls of the Oystercatchers often ring out from where they spend most of their time feeding or as they fly, but I hadn’t realised they also use it to greet other birds. I watched and listened, fascinated, as a pair performed a little greeting ritual in front of me. Their performance reminded me of the Herring Gull pair that raised their family on our roof last year and involved ‘bowing’ to one another, beaks open and pointed towards the ground whilst emitting their shrill call, rather ear-piercing at this distance. I am assuming they were a mating pair, and that is something else that is mind boggling; how on earth do they recognise one another in a crowd? The magical moment arrived when the sea had retreated just enough to expose small patches of the seabed. 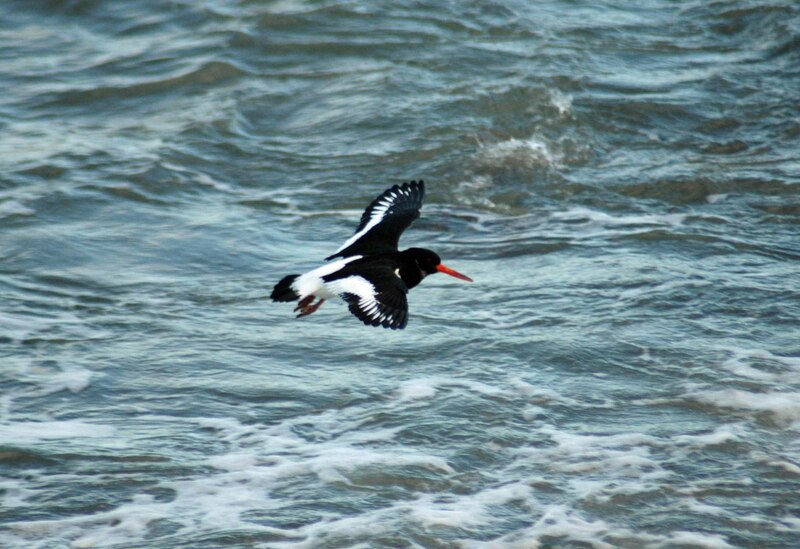 The larger Oystercatchers were first in, followed closely by the Turnstones, then the smaller Dunlin and Ringed Plovers, once they were confident they wouldn’t be caught out by a rogue returning wave with nowhere to run to. 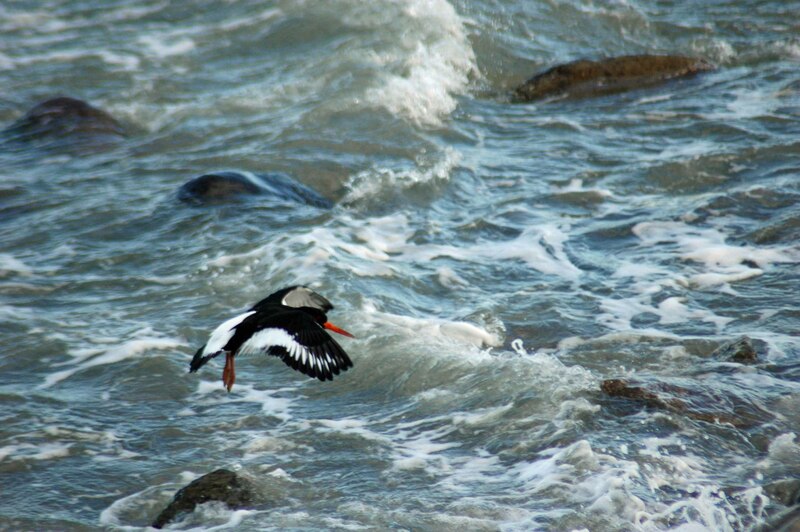 The tide comes in and goes out quickly and by the time I turned to walk back much of the rocky shore of the Point was revealed and already heavily sprinkled with Oystercatchers. I hadn’t noticed any Curlew fly in, but hearing one I looked more closely and caught sight of one that had just picked up something to eat, very closely observed by a couple of Oystercatchers, who are certainly not averse to stealing should another take its eye off its prize. 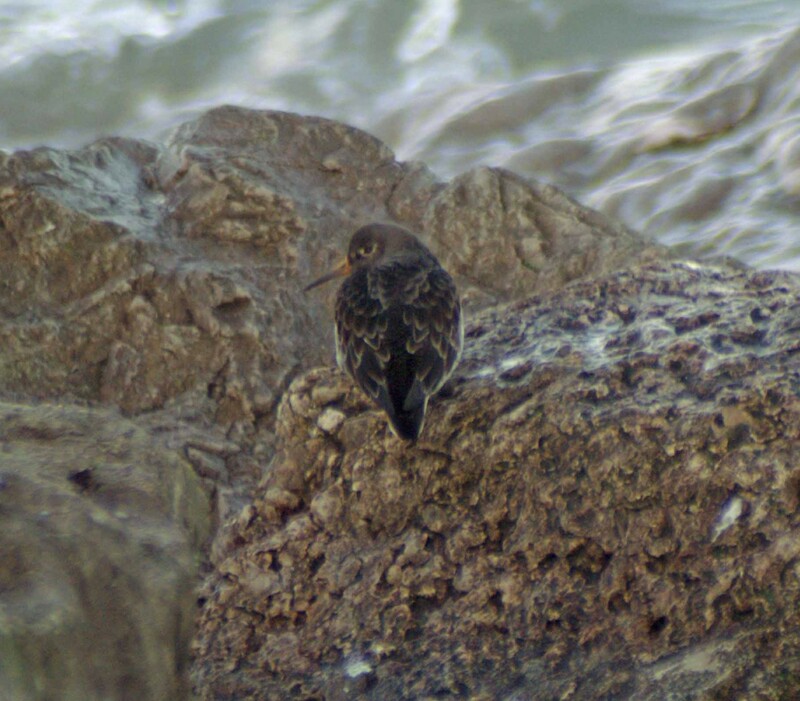 *Missing from today’s tally of waders were Redshank, and Purple Sandpipers that I have seen previously together with Turnstones, Dunlin & Plovers. Click on link to post with more photographs. 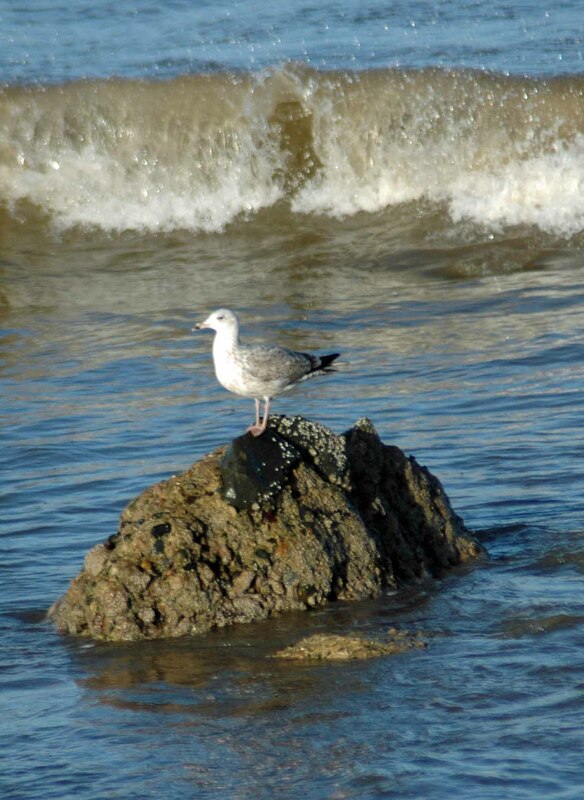 And to finish, a young herring gull, to show they are often where they are supposed to be!